One hundred actors celebrate the National Theatre’s 50th birthday by performing snippets from various plays. 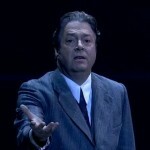 Roger Allam stars as Werner Heisenberg in Copenhagen. (23 May 2014) Half a year ago – yes this review is a bit late – I was very, very lucky. Someone cancelled their ticket for The National Theatre 50 Years on Stage, and I was able to get my hands on a return for the rehearsal on 1st of November, 2013. Olivier Circle, A38: let me tell you, that’s a pretty good seat. There was a wonderful, excited buzz from the people waiting for the evening to start. The National Theatre had kept everything pretty vague, only releasing the names of some star actors and actresses; once the programmes had been distributed animated discussions started everywhere, and it was easy to find people for an enthusiastic chat. When the seats started to fill, the Olivier Theatre was heavy with expectation. Roger Allam started his career at the National Theatre in 1995, playing Mirabell in The Way of the World. He performed in three plays in 1999: Summerfolk, Money and Troilus and Cressida. The following year he acted in Albert Speer and The Cherry Orchard. In 2003 he returned to the NT for Democracy and, more recently, in Afterlife (2008). This evening, however, Roger Allam played the German theoretical physicist Werner Heisenberg, from Michael Frayn’s Copenhagen. The story is based on a meeting between Heisenberg and his Danish colleague Niels Bohr in 1941. In the play their spirits, along with Bohr’s wife Margrethe, meet after their deaths. Together they try to understand the true reason why Heisenberg came to Copenhagen all those years ago. During his visit to the German-occupied city he lectured and discussed nuclear research, as well as potentially developing nuclear weapons. Heisenberg was one of the key pioneers of quantum mechanics – the behaviour and interactions of energy and matter – but he was also one of Hitler’s nuclear scientists. In the scene that Allam portrayed, Heisenberg explains to the audience that he intends to visit his wife and children one last time. As Heisenberg is already dead, the plot of the play does not exist in time and space, which allows the character to speak out loud as if to no one. It’s 1945 now, and World War Two is at its end. Heisenberg’s world has collapsed, and he is filled with guilt and horror at what he sees on his journey to Bavaria. His speech is heavy with questions of responsibility and the morality in science. However, the madness of the War seems to become truly clear to him when he is arrested and labelled a deserter by a Nazi soldier. His papers – signed by himself – do not grant him his freedom; instead in a stroke of genius he is able to buy it back for a pack of cigarettes. 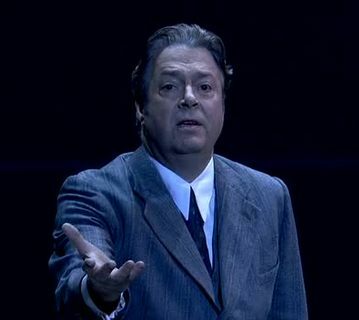 Roger Allam walked on stage right after Simon Russell Beale’s revisitation of his critically acclaimed Hamlet, to inhabit a role he had never played before – perhaps due to his widely noted desire to portray a wide variety of characters, or possibly also thanks to a personal fondness for the play and its playwright, his friend Michael Frayn (who also penned Democracy and Afterlife). Personally, I found it worked in his favour. There was a heavy silence after Hamlet’s soliloquy and after the ongoing list of famous plays, the unexpected choice of Copenhagen was refreshing. The play was a real success when it opened at the National Theatre in 1998. It ran for more than 300 performances before being transferred to the Duchess Theatre in London’s West End where it ran for another 750, as well as triggering numerous scholarly and media debates and inspiring many historical essays. Roger Allam had the stage to himself for a mere four minutes, but he played Heisenberg beautifully. There is a growing feeling of disbelief and dread, and the audience kept tensely quiet. When he held up the imaginary packet of cigarettes and named the brand – Lucky Strike – the audience laughed in relief, growing silent when realising that this was a man’s desperate attempt to save his own life. Copenhagen is known for using words figuratively, as if they should be a joke, but with such grave implications that it cannot be found funny. Allam may well have left the stage to comparatively little applause, but seemed entirely due to the audience being too moved to clap enthusiastically. After Copenhagen came a performance of My Fair Lady, certainly necessary to put the audience back into a celebratory mood. The rehearsal evening certainly wasn’t without its hiccups (which is really what rehearsals are for, after all!) During the last play, The Habit of Art, all 100 actors and actresses were required to appear on stage. Some of them, including Roger Allam himself, appeared to miss their cue completely. A few tried to sneak up on stage discreetly during Frances de la Tour’s speech, but without much success. During the live performance aired by BBC2 on the following day, the actors and actresses were divided into groups according to the year they first performed at the National Theatre. However, there had clearly been no agreement or practice before this particular run through and the result was somewhat anarchic. The 100 actors crowded the stage, many awkwardly looking about awkwardly for someone to talk or stand next to, and it led to quite a few (unintentionally) amusing moments for the audience. Thankfully, this was greatly improved upon for the live performance. This final time, the actors and actresses recited pieces of their plays, slowly building up to an overwhelming roar that left the viewer elated. During the rehearsal Roger Allam stood near the middle on the front row, holding Dame Judi Dench’s hand, but he soon stepped back to allow Sir Derek Jacobi to take his place, meaning that he found himself hovering a bit between rows during curtain call. He left stage last, gentlemanly escorting Dame Maggie Smith. On the air date, Roger Allam was grouped with other actors who had first performed in 1995 and 2000. Lingering somewhat, he was prompted to take a little run so he could rightfully take a place on the front row next the Dame Helen Mirren, Adrian Lester and Simon Russell Beale. To see National Theatre 50 Years on Stage in the place itself, surrounded by so much acting talent, theatre history and so many theatre fans was an absolute pleasure. While I can’t imagine what it must have felt like for the actors and stage crew that have worked at the National Theatre for these past five decades, it was clear to all that they were having a great time on stage, surrounded by friends and good memories. All and all, an incredible night, and I am very happy that I could be part of it.